Wolf Commercial Real Estate, a leading South Jersey commercial real estate broker that specializes in South Jersey commercial real estate listings and services, is now offering six sites of premier South Jersey land for sale throughout Williamstown. This South Jersey land for sale is available in six separate tracts located along the Black Horse Pike in the Williamstown section of Monroe Township, Gloucester County. The properties at these South Jersey land parcels for sale vary in size from 61 acres to .77 acres of developable South Jersey commercial land for sale. 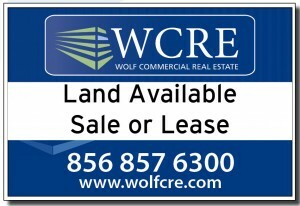 Please call Wolf Commercial Real Estate about the asking price for this land for sale in South Jersey. These South Jersey land sites for sale are available for development through Wolf Commercial Real Estate, a South Jersey commercial real estate brokerage firm that specializes in South Jersey commercial real estate listings and services. The firm has been appointed exclusive sales agent to market this land for sale in South Jersey. Black Horse Pike and Corkery Lane, 61 acres. Black Horse Pike and Corkery Lane, 8.13 acres. Black Horse Pike and Karen Drive, 5.71 acres. Black Horse Pike and Malaga Road, 1.55 acres. Black Horse Pike and Karen Drive, 1.26 acres. Black Horse Pike and Karen Drive, .77 acres. These highly visible South Jersey land parcels for sale are in a rapidly growing trade area. In addition, there is convenient access to Atlantic City and the New Jersey shore communities by using the Atlantic City Expressway which is near these South Jersey land sites for sale. Nearly 177,000 people live within a seven-mile radius of this South Jersey commercial land for sale through Wolf Commercial Real Estate, a South Jersey commercial real estate brokerage firm that specializes in South Jersey commercial real estate listings and services. The average household income for people living within five miles of this South Jersey land for sale is more than $81,000 a year. This Williamstown-based land for sale in South Jersey is in a prime retail and commercial development area and, in addition, this South Jersey land for sale is close to local health systems. A marketing brochure and property highlight materials are available upon request from Wolf Commercial Real Estate, the South Jersey commercial real estate broker that has been exclusively retained to market this South Jersey land parcels for sale. For more information about these six parcels of South Jersey land for sale in Williamstown, or any other South Jersey commercial properties for lease or sale, please contact Chris Henderson (856-857-6337; chris.henderson@wolfcre.com) or Jason Wolf (856-857-6301; jason.wolf@wolfcre.com) at Wolf Commercial Real Estate, the foremost South Jersey commercial real estate brokerage firm.